The second part of the CARES project will be a clean-up day TODAY, Friday, October 25 in a targeted area of Pottstown, from High Street north to Beech Street, and Hanover Street east to Edgewood Street. All 505 Hill School students as well as Hill faculty and staff; 50 Pottstown High School students and numerous faculty members; and many Borough workers and officials will be dispersed to weed, pick up trash, and complete other “spruce up” tasks in public spaces in the core downtown area during this day of service that precedes National Make a Difference Day (October 26). A team of volunteers also will work to beautify Edgewood Cemetery. The CARES organizers estimate that a total of 700 students and adults will be contributing to the clean-up during the morning of October 25. Last summer Borough residents were encouraged through a Mercury article and the Borough website to shares suggestions and requests for specific homeowner projects that might be tackled by the volunteers, in addition to general street and sidewalk clean-up. The massive volunteer crew will assemble under Hill’s former hockey rink roof at 8:30 a.m. to receive instructions. Pre-organized teams then will disperse to their designated project areas until about 12:30 p.m., when they will return to Hill for a picnic lunch prepared by Sodexo, Hill’s food service provider. Sodexo is generously donating the meals for all school district and borough volunteers as well as Hill students and personnel. After lunch, a celebratory group photo of all participants will be taken on Hill’s campus. In addition, as part of the October 25 clean-up day, the Pottstown School District is running a blood drive from 7:30 a.m. to 1:30 p.m. at the high school. Individuals interested in making a donation at the Pottstown High School on October 25 may send an email to Pottstown faculty member Mark Agnew at magnew@pottstownsd.org or call him at 610-970-6707. Hill’s fine woodworking class students are painting new planks for a park bench to donate for one of the MOSAIC community gardens. A team of volunteers is expected to help build new compost bins for the garden at 423 Chestnut Street. Also, Hill School art students and faculty will be canvassing neighbors to ask for input on the design of a public, downtown Pottstown mural they would like to create in partnership with Pottstown High School art students. Numerous organizations have contributed funding, tools, supplies, or other support to the CARES project. In addition to equipment being shared by each of the three entities involved – from rakes to a public address system – the United Way has generously donated $1,000 toward tool procurement in addition to loaning tools through their tool share program. Home Depot made a greatly appreciated cash donation to the project as well. CARES project organizers wish to give special thanks to the Pottstown Police Department and the Montgomery County Sheriff’s Department for their support. Individuals who would like to donate work gloves, trash or leaf bags, or tools for this and future projects may take their items to Borough Hall at 100 E. High Street. 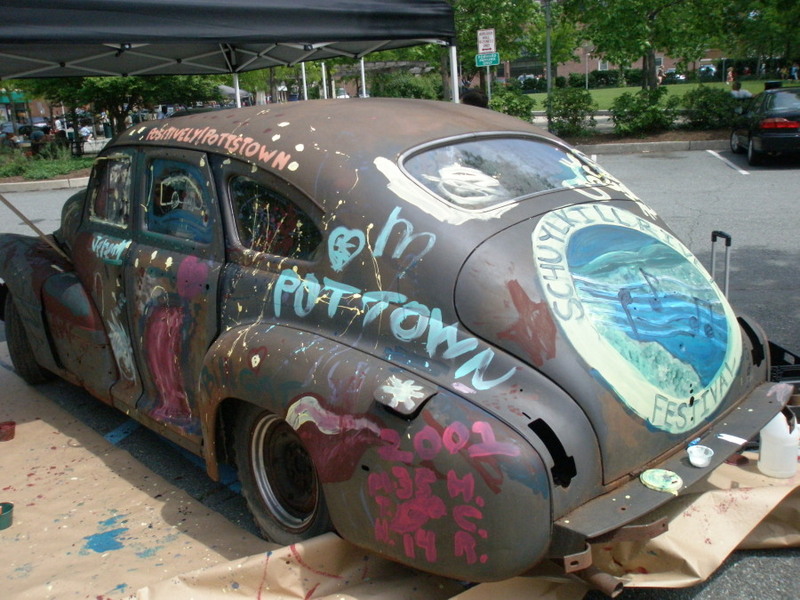 Borough Manager Mark Flanders emphasized that Pottstown CARES is not intended to be a once and done affair, but a starting point that builds momentum for additional efforts that increase residents’ pride in Pottstown. “It is my hope that this is the beginning of something bigger, and that, as time goes on, Pottstown CARES is a way of life for the residents of Pottstown – rather than a scheduled event,” Flanders noted. Hill Headmaster Zack Lehman arranged for all 505 Hill students as well as faculty and staff to participate in the October 25 clean-up day. He said he is excited about the synergy occurring between Hill, the Pottstown School District, and the Borough – and he is passionate about Hill’s involvement in the community. “Pottstown CARES provides community stakeholders with the opportunity to send the clear and inspirational message that, when working together, we are more effective in our actions,” said Dr. Jeff Sparagana, Pottstown superintendent. “Together, we are Pottstown,” Sparagana said. 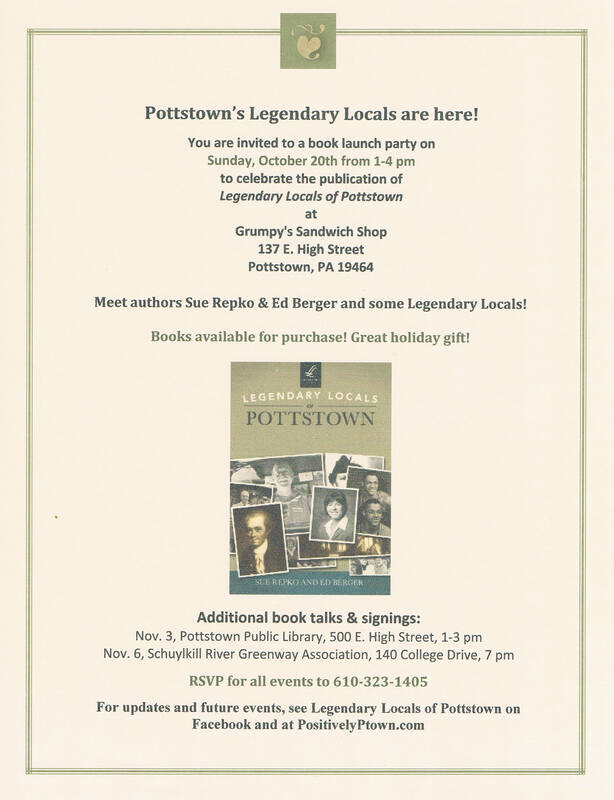 The Legendary Locals book launch party will take place Sunday, October 20th from 1-4 pm at Grumpy’s Sandwiches (137 E. High Street, Pottstown, PA 19464). Come on out, meet authors Sue Repko and Ed Berger, and get a copy of the book! Legendary Locals of Pottstown features the people who have contributed – and continue to contribute – to the life of our community in ways large and small. Sunday, Nov. 3rd, 1-3 pm, Pottstown Regional Public Library, 500 E. High Street, Pottstown. Wednesday, Nov. 6th, 7 pm, Schuylkill River Greenway Association, 140 College Drive, Pottstown. Check out Legendary Locals of Pottstown on Facebook for updates. The Pottstown CARES Project will debut on October 25th as a new kind of community cleanup day in Pottstown’s core neighborhood. CARES stands for Community, Awareness, Responsibility, Empowerment, and Sustainability. It is being organized by The Hill School, Pottstown Borough, and Pottstown School District, and will include participation by students and staff from all organizations. Right now the organizers are seeking input from residents in the form of concerns and suggestions for doable spruce-up projects that will, nevertheless, make a positive impact on the neighborhood bounded by High Street, Hanover Street, Beech Street, and Edgewood Street. Requests can be e-mailed to PottstownCARES@pottstown.org. The types of projects that could be undertaken might include painting a fence, cleaning up alleys, getting pot holes filled in, or weeds pulled from gutters and along sidewalks. Even if all the suggestions cannot be completed on Oct. 25th, the plan is to follow up with other CARES project days and the building of collaborative relationships to strengthen neighborhood pride, safety and appearance. Property owners and residents who would like work done on their property will have to sign a waiver to allow volunteers to come onto their property. For more details, see Evan Brandt’s post here on The Digital Notebook. This past Monday night Montgomery County Commissioners and the higher-ups in several County agencies were on hand at Montgomery County Community College in Pottstown to talk about what they’ve done since taking office and to answer questions and hear residents’ concerns. Evan Brandt’s article in yesterday’s Mercury provides a nice summary. Public employee pensions, the state of Route 422, the potential for gerrymandering, the ongoing challenges of revitalization, the concentration of social services and the people they serve, and the effects of the concentration of housing vouchers in Pottstown were all up for discussion. The Commissioners were well-prepared and promised to provide follow-up information to numerous citizens. Between 2008-2012, MCCC has reached out to the community with 3,695 volunteers putting in more than 33,700 hours with 117 partnering opportunities. This amounted to over $100,529 in monetary donations. In 2012 the College had the highest number of volunteers to date with over 918 volunteers contributing 15,500 hours of service to 28 partner organizations, including the Norristown Police Athletic League, Olivet Boys and Girls Club, Miller Keystone & American Red Cross Blood Drives, and Project Linues. An estimated $38,300 in monetary donations was raised. 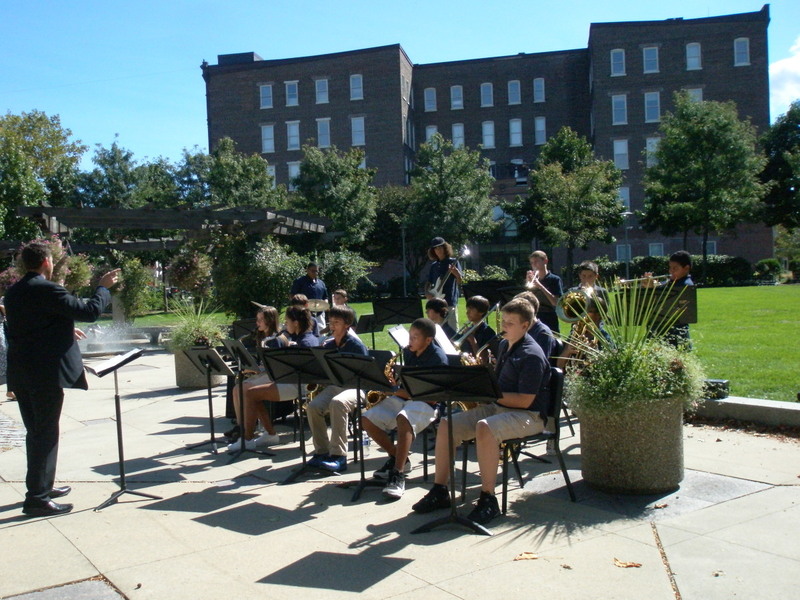 Not only is the West Campus proving to be an important revitalization partner as it rehabilitates and re-uses historic buildings in town, but there is also a strong culture of developing and sustaining connections in the community. Thanks to MCCC for hosting this meeting, which had a very strong turnout, perhaps an indication of a new core constituency that believes in a better Pottstown and is impatient for change. After a year-long effort to gather information, opinions and ideas about arts and culture in Montgomery County, Creative MontCo will unveil its 10-year plan during a launch party on Sept. 13 in the Parkhouse Hall Atrium at Montgomery County Community College’s Central Campus, 340 DeKalb Pike, Blue Bell. The celebration begins with networking from 4-4:30 p.m., followed by a presentation from 4:30-5:15 p.m. and a reception from 5:15-6 p.m. Artists, creative entrepreneurs, civic leaders, government officials and anyone who lives or works in Montgomery County is welcome to attend. To RSVP, visit http://creativemontco.eventbrite.com or call 610-313-9836. Supported in part by a major grant from the William Penn Foundation, along with support from the Montgomery County Foundation, Creative MontCo is based on the belief that culture and creativity are among a community’s most powerful assets. The initiative, chaired by MCCC President Dr. Karen A. Stout, looks to leverage the County’s cultural and creative resources to enhance economic development through implementation of a 10-year comprehensive plan. To date, more than 1,900 individuals representing all 62 municipalities in Montgomery County have participated in the initiative through a series of town hall meetings, community conversations, survey responses, interviews and discussion groups, and social media and website feedback. For more information about CreativeMontCo and to learn how to get involved, visit www.creativemontco.org. Earlier today an article in The Mercury‘s online business section announced the hiring of Steven Bamford by PAID, Inc. to serve as the first executive director of the revamped economic development entity responsible for Pottstown’s revitalization. Roy’s Rants writes that Mr. Bamford’s first day will be November 10th. Mr. Bamford brings more than 20 years of economic development experience to the position. There is much work to be done, and it’s a relief and very welcome news to hear that Pottstown has got someone with his credentials working on its behalf. Welcome aboard!